Megadeth have revealed details of their forthcoming new album. “Super Collider” will be released in June via Dave Mustaine's new label, Tradecraft, which is distributed by Universal. "It was a real thrill for us to learn there was an opportunity to join Universal," said Mustaine. "It seems like every time you see a great band or music video, it comes from a Universal label. Being with Universal is by far the most exciting and prestigious home for Megadeth ever! We are electrified with what the future holds and the possibilities such a powerhouse like Universal will bring for us all. We have worked with some great people over the years, and it is amazing to see so many of them on the Universal team for our new record, 'Super Collider'. If Megadeth being here isn't satiating enough, having Tradecraft as my own label is going to be really amazing for metal bands around the world." 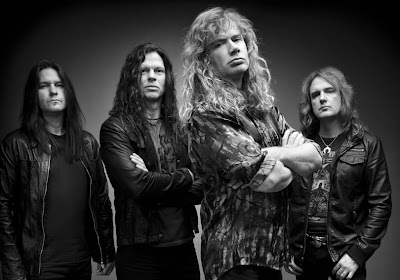 "Super Collider" is being recorded at Mustaine's Vic's Garage studio in San Marcos, California and is Megadeth's first release its recent split with Roadrunner Records. "Shawn [Drover, drums], Chris [Broderick, guitar] and David [Ellefson, bass] have all been feverishly contributing some great music and I believe we are doing our best work ever together in the studio right now," added Mustaine. Megadeth have also announced their first series of live dates, including a short UK headlining tour at the start of June, and festival appearances at Sonisphere Italy and France. Tickets for the UK shows go on sale this Friday, February 15.